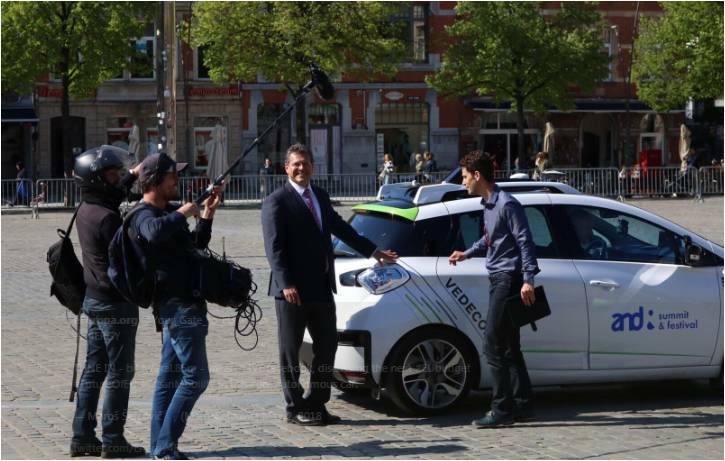 The Vice-President of the European Commission Maroš Šefčovič tested VEDECOM‘s Autonomous vehicle (level 5, without driver behind the steering wheel) driving through the beautiful streets of Leuven (Belgium) and speaking about the European projects (AUTOMATE and ADAS&ME) and discussing the EU budget for the future period (2021-2027). The VEDECOM’s vehicle was equipped with, 5 lidars and 1 radar for perception and obstacle handeling. For their localization, the car uses exclusively an algorithmic solution based on a SLAM using the on-rough Velodyne. An internal HMI details the surrounding obstacles and the path planned by the embedded intelligence of the autonomous car. Please, see in the link, further information about the ADAS&ME use cases.